Commonwealth and All Africa Games Bronze medalist Joshua Mokonjio Ndere was killed in a motor accident on Friday along the busy Nairobi-Mombasa Highway. Ndere,30, a light heavy weight boxer was reportedly killed in a head on crash. He was one of the prolific Kenyan and Armed Forces Amateur Boxing Association pugilists attached to the Kenya Navy. He burst into the international scene at the 2006 Commonwealth Games in Melbourne where he won bronze and followed it up with yet another Bronze at the All African Games in Algeria a year later. Ndere’s style of boxing was a mirror image of his charismatic personality –taking his time to gauge the opponent, then slowly punching his way with some weighty blows until the last minute. It is probably his patience and the burning drive to excel that saw him rank an impressive third in the continent in the light-heavy weight category behind the North African duo of Abdelkafid Benchebla (Algeria) and Yahia Elmekachari (Tunisia). He was a sure bet for the 2008 Olympics but unfortunately Ndere missed the Beijing Games as he was out of the country on official military assignment. “It is a very big loss for ABA, Kenyan boxing and sports as a whole, “said George ‘Foreman’ Onyango , the Amateur Boxing Association, ABA Treasurer still reeling after the sudden loss of one of the most talented boxers in recent times. The towering boxer was thrilled when he reached the semi finals last year at the Club Games in New Delhi, India and was looking to improve on his bronze medal. I feel I am on cloud nine, “Ndere told sportsnewsarena.com after winning his quarterfinal bout in Delhi last October. “Australia is one of best sporting nations. By defeating him I have evaluated my skills and I now know that I can beat anyone and anywhere, “he added smiling and laughing, his usual grin curving his lips. But unfortunately he found a tough opponent in Thomas McCarthy from Northern Ireland and had to settle for the Bronze. "I battled hard against Thomas McCarthy, but a few mistakes here and there cost me, now my focus now is the Olympics," accentuating his positivity, can-do and press-on attitude. But the car crash in Samburu on Friday at about 3pm cut short the Gold medal dream of the talented Kenyan boxer. 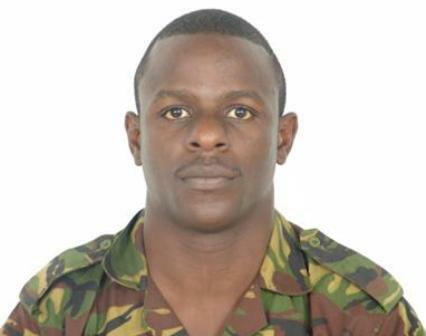 “He had just started his annual leave today and was driving from his base in Mombasa, “a colleague from the Kenyan Navy who asked not be named said. “We were later told his Toyota G-touring crashed along the way." Details about the crash however remain scanty. His last major assignment was at the World Military Games in Rio De Janeiro in Brazil where he lost in the preliminary rounds after missing out on the Pan African games in Maputo due to the recent power struggles that have rocked ABA. He was also part of the team that represented the country at the 2009 World Boxing championships in Italy.